How do I Change the Title Which Appears on the Brower Tab when my Form Loads at its URL? 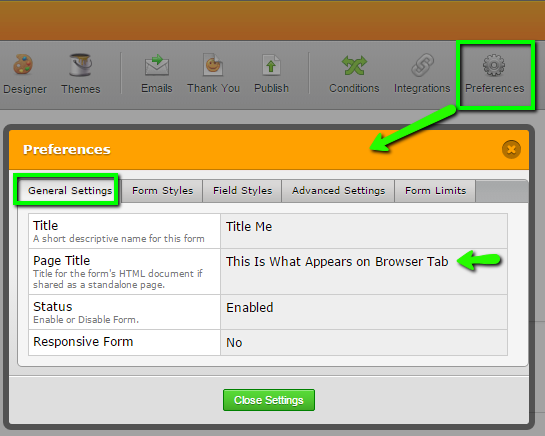 I have Dutch forms and in the tab on top of the browser stands 'formulier'. The Dutch word for 'form'. Now I have one French form and also on this tab stays 'formulier' when you open it. I changed the name of the form into 'formulaire' but where can I change this in French? Is it possible? Is it because of the language I selected? Please inform us if you would like further help with this. Since the latest update the option to change "Page Title" no longer exists. Is there another work around you could provide? I have moved your post to a new thread here: https://www.jotform.com/answers/845286 which we will be answering shortly.